Fall has been surprisingly busy season so I have so much to share! 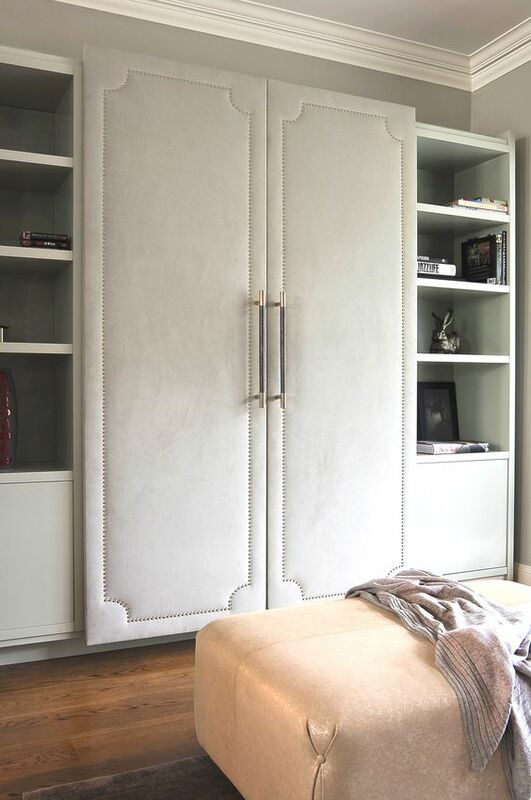 I guess I’ll start with a little teaser of a project we are hoping to finish up on Monday, which is a series of upholstered closet doors! I’ve had some sneak peeks from the upholsterer and they are looking so beautiful. 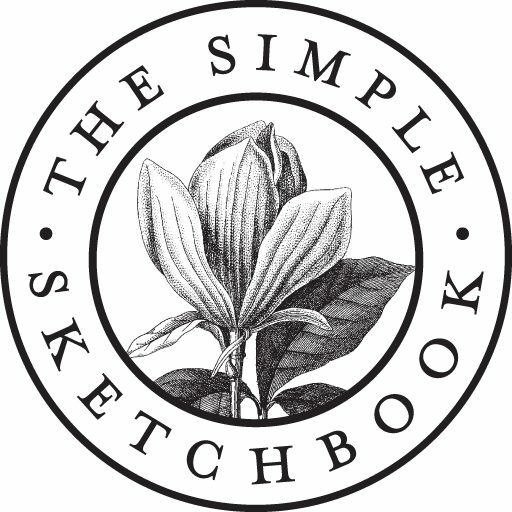 There are many ways of executing the details on such a project, so I thought I’d walk you through our process. 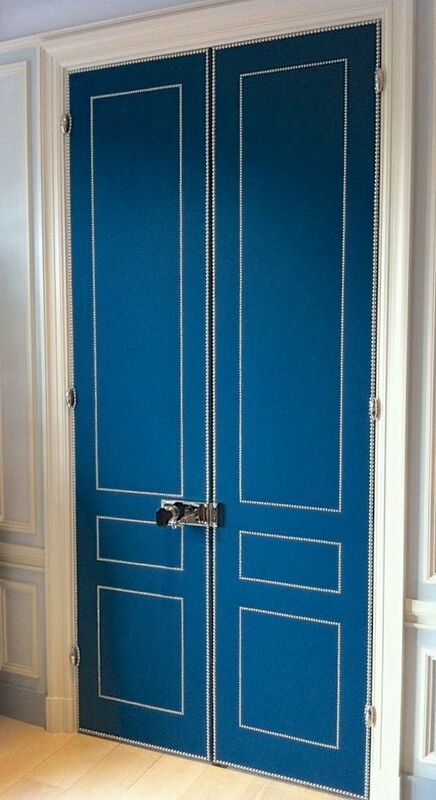 If you all decide to upholster a door after reading this, the world will be a more lovely place. After immersing yourself in inspiration pictures, it’s time to really figure out how you are going to get these done. Are you wanting to add these to existing doors or new? This is important! Keep scrolling for a list of talking points to consider before you begin your project. 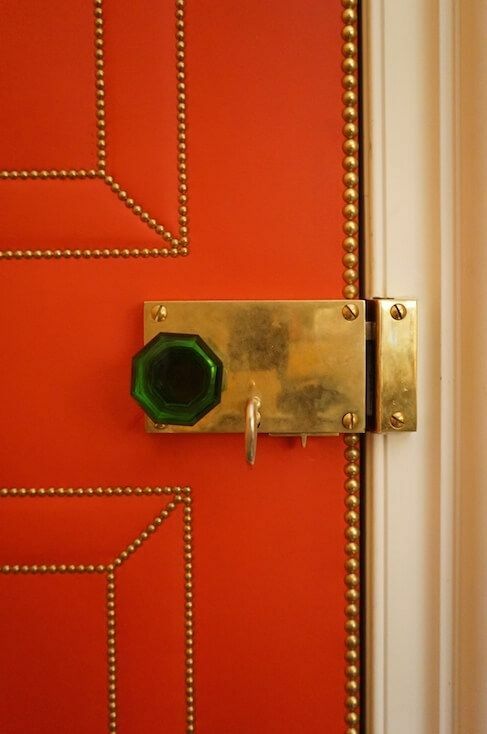 Two Nailhead Sizes used in this orange lacquer door by Bories & Shearron. This is so important! 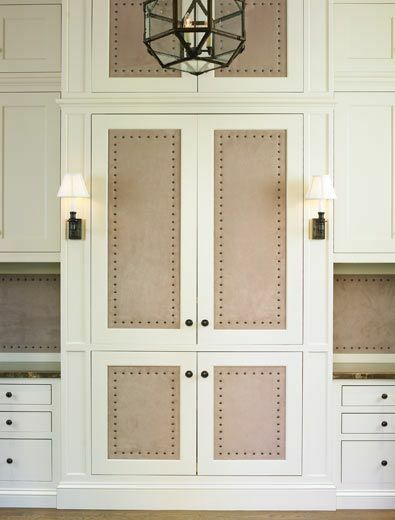 Nailheads need 1/2″ of wood in order to fasten to the door. Hollow core are less expensive and lighter in weight, so your project may not allow for a solid door. 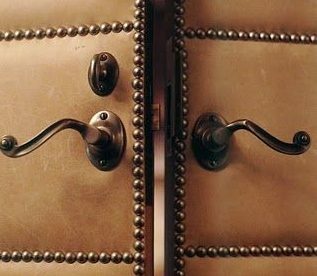 Hollow doors still have areas of wood throughout, so you just need to make sure the door adequately supports your nailhead design. 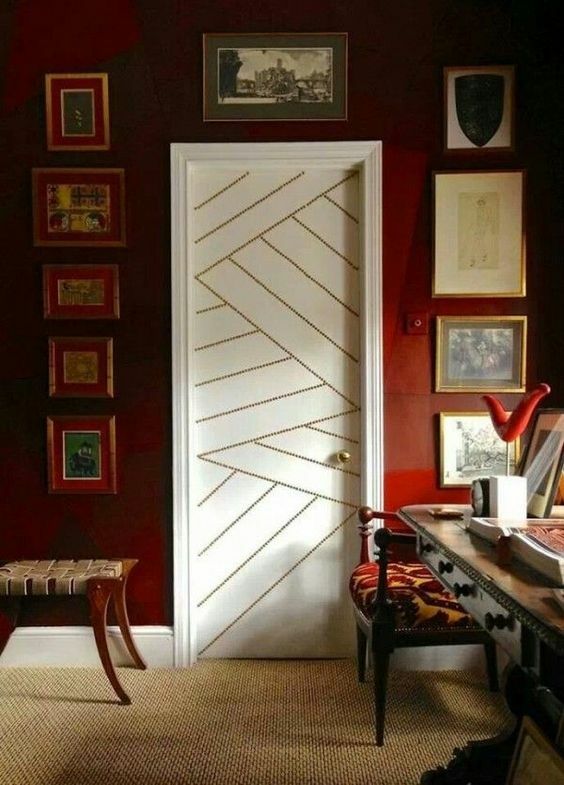 How do you want to execute the sides of your doors? 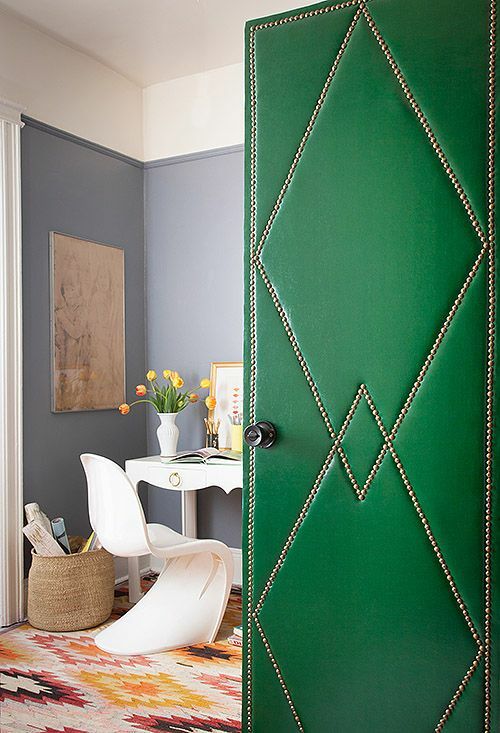 If you plan to wrap the textile around the sides, your doors may need to be cut down to accommodate additional width. We chose to finish our sides with nailhead, and paint the sides and backs of our doors. Honestly, I have zero understanding how this (gorgeous) decorative tape below passes any test of time with a door’s constant opening and closing. Here is a very helpful door upholstery guide that addresses the issue of door sides. There are a variety of nailheads – different sizes, shapes and colors. Your upholsterer has to hammer EVERY. SINGLE. ONE. by hand. 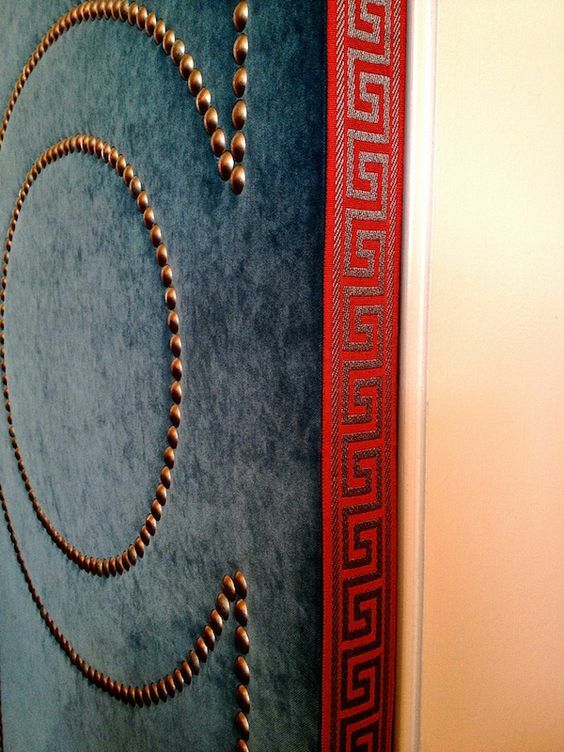 More elaborate nailhead designs might create a significant price change in your project. 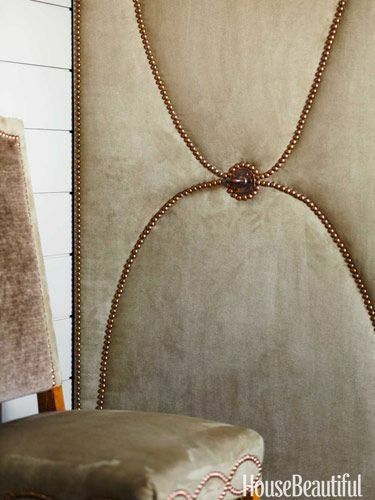 To simplify upholstery time here, you can purchase these nailhead trim strips (you nail in one out of every ten nailheads on the trim) but this is not advised for a very high end luxury look. This tactic looked great in Mrs. Palmsey’s door project, but I just knew it wasn’t going to work for my client. 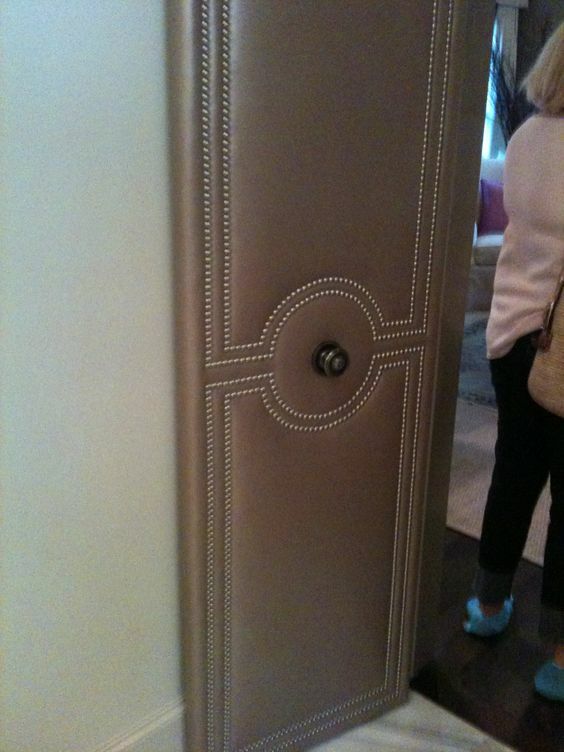 Many people mimic a traditional door design with the nailheads, but my current project takes a different approach. For starters, fabric is not even necessary! 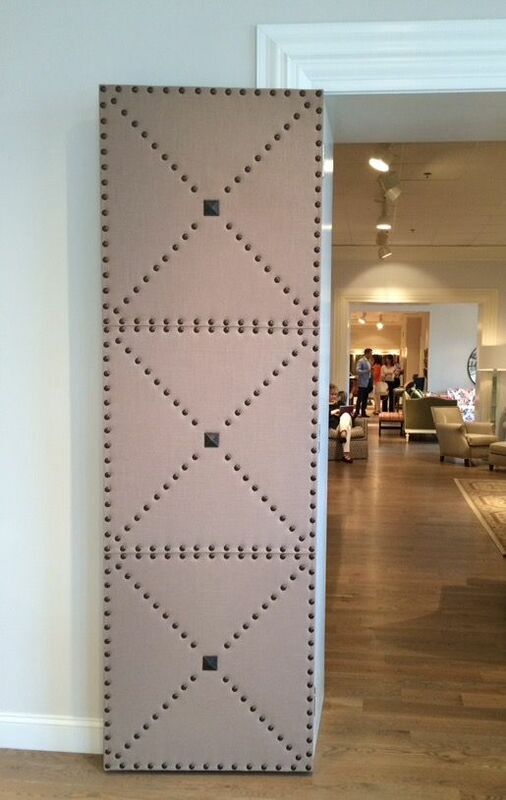 You can choose to paint and simply add nailheads. 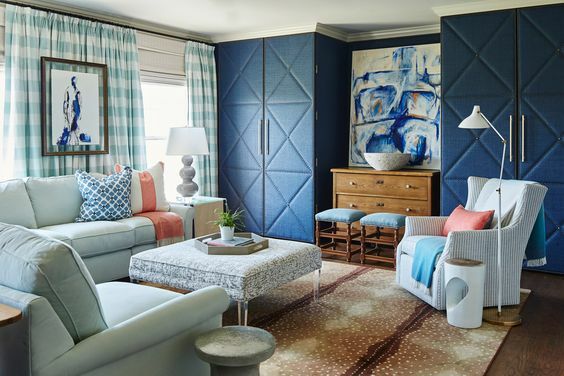 But the fabric and batting of the upholstery creates a depth that is simply stunning. And beware the leather! Ahh, the leather. We used a leather-like vinyl. It’s gorgeous, but keep in mind that every hole is there forever. With other textiles, a incorrectly placed nailhead can be moved. But with leather, that hole is permanent. Oh, the options! Lots of people follow the traditional pattern of door detailing. But beware the circle! This takes longer to upholster due to the precision needed, and when it’s not done exactly right, the look is unfortunate. Upholstering a Panel is most certainly an easier route. 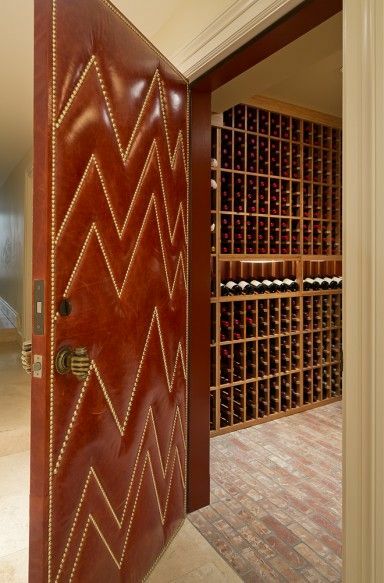 It is far easier to carry a wood panel to and from the upholster than a solid door. I imagine it has it’s own challenges in regards to upholstery, but we didn’t go that route, so I wouldn’t know what they were! You are ALMOST THERE! Your doorknob will need to most likely be placed before the door is upholstered, so make sure your measurements are spot on. The results are exquisite! And now you are just getting started! 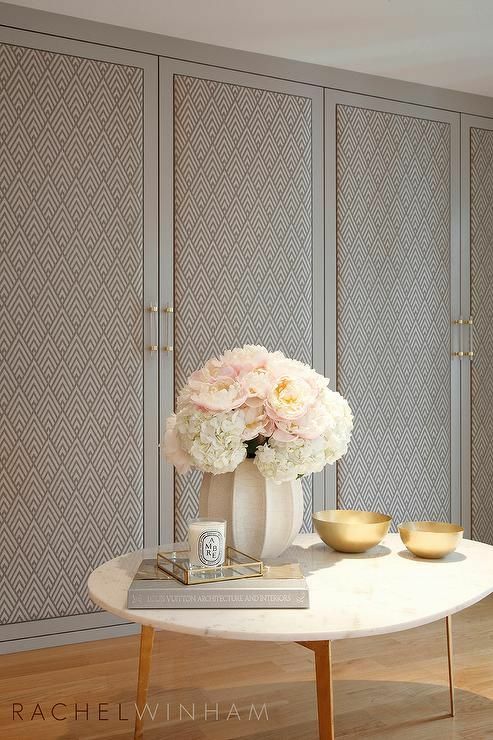 Don’t you just want to upholster your walls and cabinetry? You can! Here is the a great tutorial I found about upholstering walls from Design Sponge (part one, part two).